Former U.S. Rep. Corrine Brown Convicted Of Stealing From Phony Charity : The Two-Way Prosecutors alleged the Florida Democrat and her chief of staff pocketed hundreds of thousands of dollars they'd raised for scholarships — and jurors agreed, convicting her of conspiracy and fraud. Former Rep. Corrine Brown — seen talking with the press in Tallahassee, Fla., in 2015 — was convicted Thursday of more than a dozen charges in her federal fraud trial. 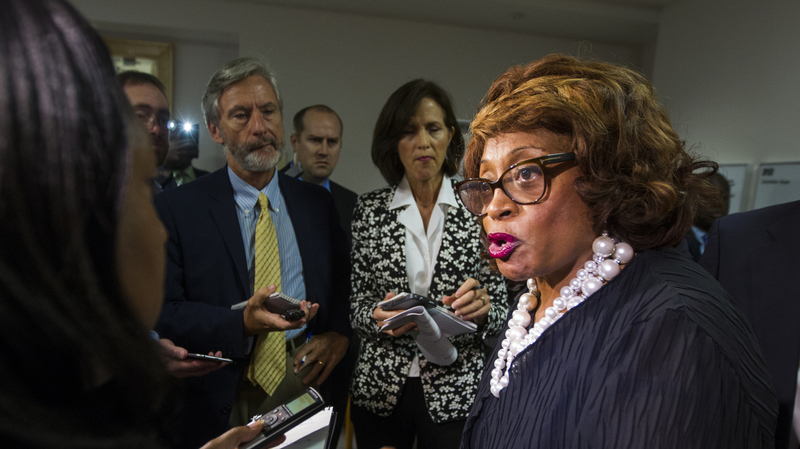 Former U.S. Rep. Corrine Brown has been found guilty of siphoning hundreds of thousands of dollars from a charity that she and her chief of staff had passed off as a scholarship service for students. The Florida Democrat had faced 22 counts ranging from conspiracy to tax fraud; she was convicted of 18. Of the more than $800,000 she and Elias "Ronnie" Simmons raised for One Door for Education, member station WJCT reports that just $1,200 actually went where they told donors it would: students' education. In roughly five years, prosecutors say, the charity distributed just two scholarships. Prosecutors alleged — and on Thursday, the jury agreed — that Brown and Simmons pocketed the rest of the funds, using them for lavish events such as a golf tournament and luxury boxes for an NFL game and a Beyonce concert. "Assistant U.S. Attorneys Tysen Duva and Eric Olshan painted Brown as an egotistical politician who lived beyond her means. Using bank records, checks, letters, emails and hundreds of other documents, prosecutors made the case Brown directed the deposit of $37,000 of One Door cash into her account. They also claimed she was instrumental in planning nine events that cost the sham charity $330,000." Brown had argued that the fraud was entirely the doing of Simmons, who earlier pleaded guilty and testified against her. Brown didn't speak after the verdict was rendered, but her attorney James Smith told reporters, "I still have a lot of work to do on this case," referring to the sentencing phase and the motion he plans to file for a new trial. WJCT's Ryan Michael Benk reports the sentencing phase could take 90 days or longer for Brown, who left office earlier this year after losing her re-election bid in the district she had represented for nearly a quarter-century.